Quiet and romantic nightlife on Koh Chang. Bar del Mar in Klong Prao Beach is located next to The Dewa Resort and offer food and drinks direct on the beach with nice sunset views on Koh Chang. The chilled atmosphere attracts tourists and backpacker who looking for a peaceful place to enjoy slow nightlife on Ko Chang in Thailand. The drinks and food are served at reasonable prices. This wonderful stripe of water is a unique place for romantic evenings and candle light dinner’s on honeymoon or tropical beach holidays in Asia. 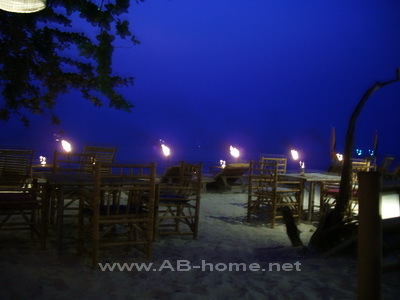 Bar Del Mar Koh Chang offers also scuba diving tour booking and travel services. At Bar del Mar Klong Prao you can listen to the sound of the waves and the quiet chill music of the speakers. This place is a great location for all who like to relax and come down from the all day life.